New Zealand 7-402 (Hamish Rutherford 171, Peter Fulton 55, James Anderson 4-108) leads England 167 (Jonathan Trott 45, Ian Bell 24, Neil Wagner 4-42) by 235 runs. Hamish Rutherford tore apart the powerful bowling line up of England and thrashed a ton on debut as New Zealand took a sizeable lead against the visitors. The first innings of England was squeezed for 167 runs in 55 overs and the Black Caps hammered 402 for the loss of seven wickets after playing 108 overs. The third day’s play concluded on Friday, March 8, 2013, at University Oval, Dunedin. Earlier, the Kiwis started the day in a commanding position at 131 without any loss in 42 overs whereas Hamish Rutherford and Peter Fulton were unbeaten at 77 and 46 runs accordingly. The pair got off to a nice beginning as Rutherford hit a couple of fours in the 46th over and Fulton attained his second Test fifty two overs later. The home side lost their first wicket at 158 when Fulton was caught behind by the wicketkeeper Matt Prior off James Anderson for 55. 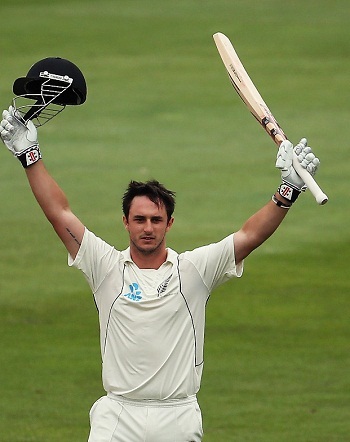 Hamish Rutherford thrashed his maiden Test hundred on debut with a four on the third ball of the 52nd over as the newcomer Kane Williamson kept on securing his end. The first was playing his brave knock as the latter scored just 6 runs off the first 41 balls he faced and tasted his first four in the 64th over. Rutherford added 14 runs in the next over with 3 fours as the hosts went past the 200 runs mark as well. The partnership kept on flourishing as Rutherford punished Monty Panesar for 15 runs in the 72nd over with 2 lofty sixes. The second wicket fell at 249 as Kane Williamson was clean bowled by Panesar for 24 and was replaced by Ross Taylor. Hamish Rutherford became the next victim after the addition of 18 runs to the total after powering 171 off 217 deliveries with 3 huge sixes and 22 fours. Dean Brownlie associated with Taylor, they preferred to play an attacking cricket and the ball was crossing the rope at regular intervals. Brownlie hit 2 fours in the 88th over as Ross Taylor was caught by Jonathan Trott at second slip off Anderson for 31in the 91st over. 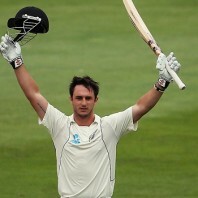 Brownlie followed him in the 93rd over for 27 and BJ Watling went back to the pavilion without opening his account. New Zealand lost their sixth wicket at 326 in 93.4 overs when Tim Southee got together with his skipper, Brendon McCullum. Southee got the first six of his innings in the 96th over as McCullum hit 3 fours in the next over off Steven Finn. The Kiwis got the 200 runs lead in the 98th over when the stumps of Southee were broken by Stuart Broad for 25 as the score touched 370 runs. Brendon McCullum remained unbeaten for 44 off 42 balls with 8 fours and Bruce Martin was at the other end with 17 as New Zealand piled up 402 in 108 overs with three wickets in hand at stumps on day three. 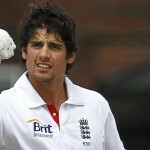 James Anderson was the supreme bowler with four wickets, Stuart Broad held two whereas Monty Panesar claimed one wicket. New Zealand has gained an overall first innings lead of 235 runs and they can add a few more useful runs whereas England looks in a difficult situation since the match has already slipped away from their hands.